COLUMBUS, OH--(Marketwired - April 06, 2016) - Every day there are new reports of rogue drones, nuisance drones and potentially dangerous drones as the market explodes. Nearly as often, we hear about ways to thwart them. Battelle's DroneDefender has piqued the interest of authorities around the world. The technology is restricted to use by federally authorities under a strict permitting process, but sales are taking off with nearly 100 units sold to the U.S. Department of Defense and the U.S. Department of Homeland Security. The Battelle DroneDefender uses radio control frequency disruption to safely stop drones in the air before they can pose a threat to military or civilian safety. It is an inexpensive, lightweight point-and-shoot system with a demonstrated range of 400 meters. When the DroneDefender takes aim at the drone, most drones revert to one of three pre-programmed protocols: Hover in place, slowly descend and land, or return to its flight origin point. Click HERE to see a simulation of it in action. "The idea is to quickly halt the drone and to stop it from being a threat," said Dan Stamm, a researcher who helped develop it along with fellow scientist Alex Morrow. "While there are other more elaborate and expensive systems on the market, clearly we have tapped into a need for this style of anti-drone device judging from the overwhelming interest shown in the DroneDefender," he said. 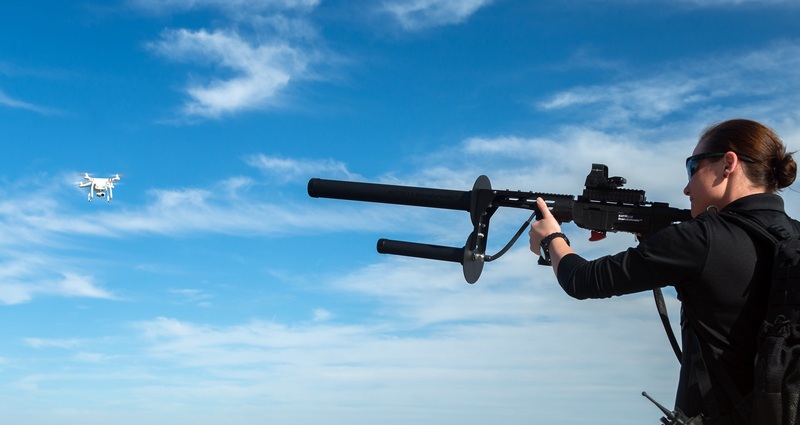 Battelle is continually refining the DroneDefender technology to help ensure its continued value in securing U.S. assets. The newest version that is currently in development has added technical capabilities, is reduced in size and weight, has an improved user interface, and is less expensive. Battelle has a long history of developing tactical equipment for many branches of the military, working closely with operators to develop, build and field critical equipment to help meet mission needs. DroneDefender units are being produced at Battelle's Advanced Manufacturing facility in Dublin, Ohio. A newer model of the Battelle DroneDefender.